WASHINGTON (CNN) -- The organizers of the Vietnam Veterans Memorial and Federal Express are issuing a nationwide "call for photos" to help document the stories of those lost in the war. 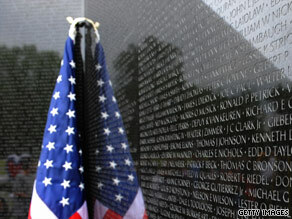 A new project is trying to put a face to each of the 58,261 names listed on the Vietnam Wall. The images will be compiled and displayed at an education center near the Vietnam Wall on the National Mall. To get the original snapshots converted to a digital image that can be stored, the retail chain FedEx Office is providing free electronic scanning service at its 1,600 stores across the country. Colleen Shine, who lost her father and her uncle in the war, said the effort will pull together "the faces and stories of all the names on the Wall." At least one photo is sought for each of the 58,261 names on the Vietnam Veterans Memorial. About 10,000 names are already represented on a Web site run by the memorial's foundation. FedEx staff will also spend time collecting some details about the lost veteran, as described by the family and friends submitting the photographs at the store location.